Jaeden wanted to make her own baking creation, her secret recipe, so I let her go to town. She added flour, salt, LOTS of sugar and asked me to put in an egg and a few other things. She is so proud. We baked her secret recipe and when they were finally done, she wasn't quite sure she wanted to eat it. She was very hesitant and tried to get Avery to eat one with her but Avery refused. This is her first and only bite. I asked her how they tasted and this was how she replied. She cracks me up but I love that she wanted to try. so cute! good for her for trying! 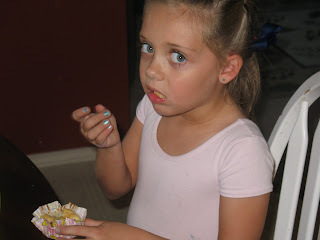 HAHAHA Love that face she is making when she took a bite LOL looks just like you in that picture!! TOO cute!! Yuk! I a mean yummy... nope I mean YUK! What a great mommy you are for letting her do this. Way to encourage food play- the O.T. actually suggested a lot more food play and experimenting for Emma. Maybe we will do this too sometime.